My fiancé, Chris and I live on a boat. Like not just on weekends, no, no. We LIVE on a boat. After living with 2 other roommates for a year and half and things not ended very well, we were at the point in our lives where we either needed to buy a house or just move into another apartment and do that whole adulting thing I hear people talk about. Instead, we chose adventure. The house buying part sounded like a great plan until we realized we needed to have a lot more money in order to do so in Southern California so we decided to look for another solution before settling for the apartment. For the last year or so, Chris and I have been following a lot of YouTubers who are traveling the world by van and some by sailboat. Although we love that they are able to do this and provide us with endless hours of entertaining videos to watch, we never really thought that it could become our reality. In his early twenties, Chris lived on a small sailboat in the Ventura marina up near Santa Barbara, CA. He’s always told me that one day he would like to get another boat. I, on the other hand, have zero experience with boating aside from my camp years out on a lake in a canoe. But as we started talking more and more about boat life and what it might look like to live on one in Southern California, the idea really started to get me excited. 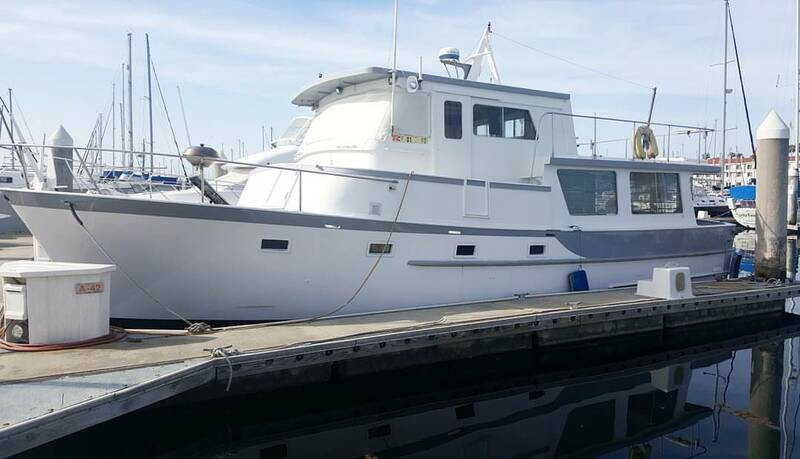 After just a few months of searching, we came upon a beautiful 1973 43ft trawler (typically used for fishing) perfectly located just 20 minutes away from our place. The living space was way bigger than I ever imagined, it had a full kitchen, 2 bathrooms and enough convertible couches and beds to sleep 10 people! We fell in love. After some important inspections, a sea-trial and a haul-out where we inspect the bottom of the boat, we emptied our savings accounts and Solstice was ours. The very same day, a spot became available at our dream marina. Talk about perfect timing! As a wedding planner and entrepreneur, my day to day life on a boat looks a little like this: Wake up, make coffee, walk the dogs – oh yeah we have 2 dogs who love living on the boat and enjoy sunbathing on the deck – check emails using our phone’s hotspot (yes, I did drop my phone in the marina once), make some client calls, make lunch, maybe go out and do some site tours, write some blog posts, make dinner and enjoy a glass of wine on the deck. Basically, everything I would do if I were living on land. Although we don’t plan to live on Solstice forever, we like that this is a place to call our own. It gives us the chance to save up for a home because we pay significantly less than any apartment in Southern California, we meet the kindest people and well, it’s a great place to hang out on weekends too! Why am I telling you this? I want to show you that you can still enjoy adventure while being an entrepreneur and working hard. I still get back to all my clients and vendors in a timeline manner. I still lead my TuesdaysTogether meetings. I still meet fellow creatives for brainstorming lunches. I still blog and post on social media. I still take on as many clients as I can but I also feel more inspired and creative on a daily basis because I wake up in a house on water and I fall asleep to some of the most spectacular sunsets. Even if this post simply encourages you to work from a cabin in the woods for a week, do a house swap with another creative in another country, or hop in a camper van and travel all over the US while working on your art, how cool would it be to invite adventure into your every day life and not just while on vacation?! If you have questions about our aquatic life or want to follow our journey, you can find us on Instagram @mvsolstice! Born and raised in beautiful Montreal, Canada, Gabby was surrounded by Nature’s beauty early on. Wanting to discover the West Coast, she moved to Manhattan Beach in 2010 and founded ‘Cause We Can Events – a wedding planning and design company for the Wanderers of the World. She spends most of her free time exploring the Southern California trails with her man and two pups or on horseback with her mare, Candee. She’s a dreamer, a wanderer but a go-getter with a love for adventure and peanut butter.